Alpacas are native to the high Andes Mountains of South America. Alpacas most be one of the world’s oldest domesticated breads of livestock, with a history predating the Inca Empire. Alpacas have played a central role in the Andean cultures for more than five thousand years. There are two kinds of Alpaca; the Suri and the Huancaya. Bolivia has the second biggest population, at global level, of alpacas with an estimated 324,321 head (FAO 1996). Alpaca qualities are classified in three main categories. Which is taken from the finest part of the fleece of the first shearing. This much frizzed fibre has a fineness value of 19-23 microns. Is the finest part of the fleece from successive shearings and has a fineness value of 24-26 microns. The coarse hair taken from adult animals that have had several shearings and inferior hair from all the fleeces form his grade which has a fineness value of 28-33 microns. As in the case of Alpaca the llama is indigenous to the Andean regions of South America, where for centuries it was widely used as a pack animal by the Incas and other natives of the Andes mountains. 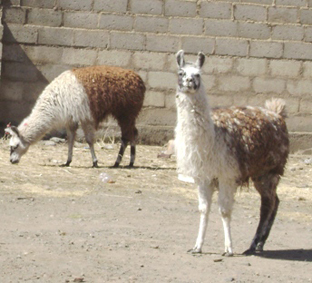 In remote areas of the Andes llamas are still used as beasts of burden. In this hostile environment life would be virtually impossible for the people who live their without the llama as it provides them with fibre for domestic textiles and meat for their very existence. In Bolivia the llama population exceeds 2.000.000 specimens (FAO 1996) making Bolivia home to the largest number of llamas at global level. It is important stress that the members and the independent suppliers of fibre to COPROCA only use the hand shearing technique of taking the fibre from the animals. This is not harmful in any way to the animals (alpacas and llamas), and COPROCA will not accept any fibre which has been taken from animals whid have been harmed or killed. 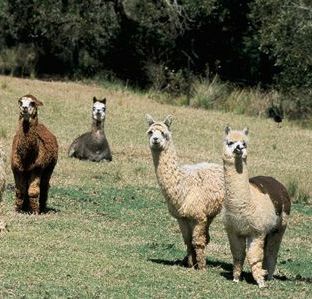 Both Alpaca and Llama fibers possess their unique and exceptional characteristics whid have been appreciated by the International Textile Industry since the mid 19th Century. - Prestige. As with vicuña, cashmere, mohair, silk and angora rabbit hair the alpaca and llama fibres are considered as some of the most highly sought after fibres in the world of fashion. - Softness. Both alpaca and llama fibres possess a soft silky touch. - Appearance. Alpaca and llama fibres are elegant in appearance, revealing a soft and long lasting quality whid because of their durability is maintained over time. They also have by for the widest range of natural colours to be found in any of the animal fibres. - Thermal Characteristics. Because of the structure of the fibres, garments made from alpaca / llama possess the most desirable thermal properties. - Durability. Garments produced form alpaca/llama are extremely durable, and with careful washing (low temperature, soft detergents) can keep their original appearance for many years. - Elasticity and resistance. Alpaca/Llama fibers have a high elasticity rating and their resistance is much higher in comparison with other animal fibers. - Hygroscopic Characteristics. These fibres absorb environmental humidity very slowly. - Non-Flammable. Alpaca/Llama fibres possess a very low combustibility unless subjected to direct contact with flames. Alpaca and Llama fibers are Ecologically friendly, both types of fibres keep their natural characteristics and during their processing are not exposed to toxic products. COPROCA’s tops and yarns are 100% pure Alpaca or pure Llama, and no combinations are made with other natural or synthetic unless specifically requested by our clients in yarns of specific uses. COPROCA - Bolivia > Address: 10 Th Puerto de Ilo Av., El Porvenir Zone (El Alto) > Phone (591-2) 285-2040 > Fax (591-2) 285-0685 > La Paz, Bolivia.